The Chicago Board of Education, almost in secret, has scheduled hearings on three new charter schools to be established by next school year. The hearings, which were noted on the CPS website (www.cps.edu) mark the continued attempt by the Emanuel administration to expand charter schools in Chicago while ignoring the problems at the city's existing charter schools. According to the CPS announcement, the hearings will begin at 5:30 p.m. on Thursday, October 6, 2011. 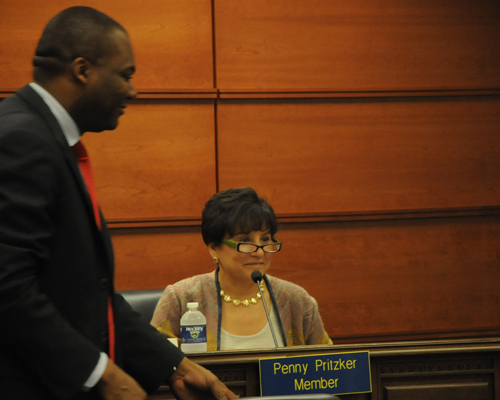 Chicago Board of Education member Penny Pritzker (above, at the Board's June 15, 2011 meeting) has been a vicious supporter of the privitization of public schools through charter schools for nearly a decade. Although the Pritzker family once provided support to real public schools (the Pritzker Elementary School in Wicker Park predates the current generation, which more closely follows the pseudo-philosophy of Ayn Rand than the New Deal versions of economic and political reality that helped create the family's fortunes more than 70 years ago), Pritzker activities lately have been to provide vast amounts of money to privatization, such as the Noble Network of Charter Schools. After Rahm Emanuel appointed billionaire Penny Pritzker to the seven-member Chicago Board of Education in May 2011, her first vote was to affirm the fraudulent claims made by incoming Chief Executive Officer Jean-Claude Brizard that the Board was facing an "unprecedented deficit" and therefore had to break the contracts with the eight unions representing school workers. Pritzker has been silent during the four Board meetings since, when Brizard has brought personnel and other expenses before the Board members in secret session resulting in a vast expansion of new people in newly created positions at six-figure salaries. One of Penny Pritzker's employees, Beth Swanson, now works as Mayor Emanuel's liaison to CPS. Substance photo by George N. Schmidt. The events, which are called "community forums," have been deliberately scheduled to take place in the most expensive and inaccessible location in Chicago — the Loop headquarters of the Chicago Public Schools at 125 S. Clark St. Parking for those who bring their cars to the area can cost as much as $29 (the parking lots were privatized under former Mayor Richard M. Daley and have escalated their prices since). No meetings are scheduled in the actual Chicago neighborhoods (or "communities") where the charter schools are to be located, because the CPS "Office of New Schools" want to keep the community that will be affected by the charter schools from having access to the hearings. CPS has also announced that only people with photo IDs will be allowed in to the hearings. The Board of Education has also made it clear that the events will not be open to community input. According to the announcement, the charter schools will make their presentations, and people will only be allowed to ask questions. Since every charter school has an enormous impact on a community, restricting the community's input on the charter school itself is a way of narrowing community input. Each of the three charter schools scheduled for this Thursday has a controversial history. The Noble Street Charter School Network (which called itself the "Noble Network", for example), kicks out students every year just prior to the testing cycle. Last January, for example, Nobel Network sent six students to the Kelvyn Park High School. Once Noble Street has eliminated the kids most likely to have low scores, the remainder are tests, and the scores are impressively (but artificially high). Noble Street has been using this trick to show "better" scores than its neighbors since Noble chief Michael Milkie left Wells High School more than a decade ago to become a charter school entrepreneur. Within a year, Wells High School teachers and counselors were reporting to Substance the annual Noble rejects, a product of what some called "The Milkie Method." Although the Noble Street rejects originally went to Wells, as Noble Street was allowed to expand during the years Arne Duncan served as Chief Executive Officer of CPS, the same method was used. Most recently, in January 2011 teachers from Kelvyn Park High School showed Substance the most recent evidence: six kids who had been kicked out of Noble Street "Pritzker Campus" just in time for their scores to be eliminated from the school's statistical claims. During the mayoral election campaign, Rahm Emanuel tried to claim that Nobel Street and other Chicago charter schools were the "best public schools in Chicago," ignoring all of the inconvenient facts such as those above. The UNO charter schools are another story. In addition to raiding nearby public schools (some in the community have called it "plundering"), Noble Street also has an apparent way of providing a "safe" environment to only one group of "minority" students. Before Chicago public schools were relieved of the obligations to show that new schools would not be further segregated, UNO schools would have been brought into court as an example of segregationist policies — against African American children. UNO charter schools are one of the reasons why Chicago's charter schools became a new segregated school system within a system since they were encouraged to expand by government policy (under Arne Duncan and Renaissance 2010) and private corporate philanthropy (more than $50 million was raised and spent during the days of the "Renaissance Schools Fund" for Chicago charters — never for real public schools). The equally controversial LEARN charter schools are now pushing out real public schools in Chicago's South Chicago community. The CPS Office of New Schools is holding a combined Community Forum to consider 3 separate proposals to open new charter schools in 2012 and 2013. At the Community Forums, each school Design Team will give a brief presentation on proposals currently being considered for approval by the Board of Education. Following the presentation, the audience will have an opportunity to ask each Design Team questions about the proposals. Please note that the Community Forum is not meant as an opportunity to provide public statements, though attendees will be able to respond to a survey at the conclusion of the meeting and may provide ad- ditional written comments to CPS representatives. Where was this even posted? I didn't do any deep digging or googling yet, but I don't even see it on CPS's website. I hope some good questions get asked!